Right after Christmas of 2015, lots of boxes filled with electronics components and assemblies started showing up at AS220 Labs. 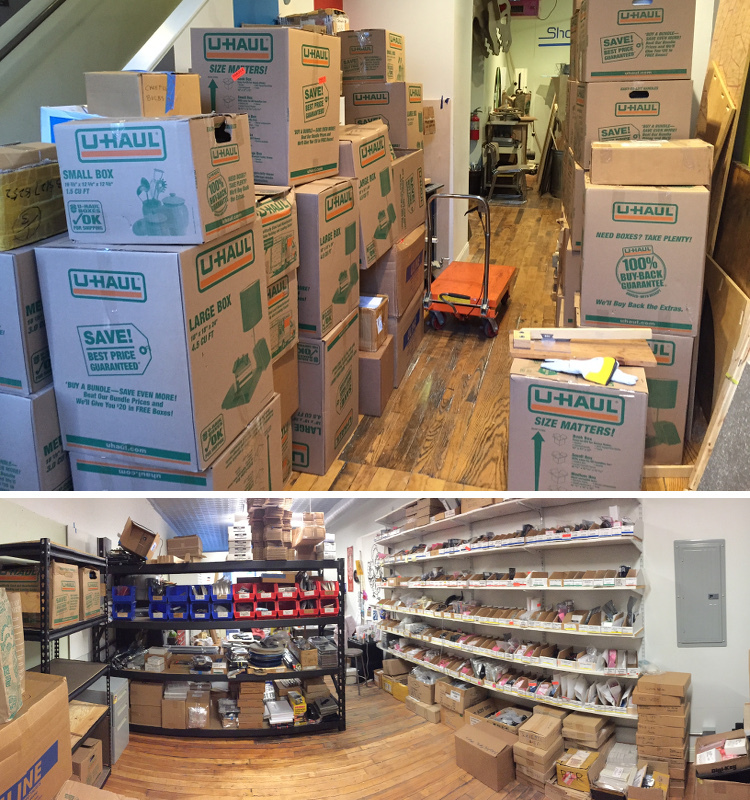 Three Uhauls worth of parts and inventory went up on shelves and the next day customers of Modern Device started receiving their deliveries from a new address; that of the AS220 Industries. Earlier this year we finished what was a many month process of merging the Modern Device electronics kit business with AS220 Labs. 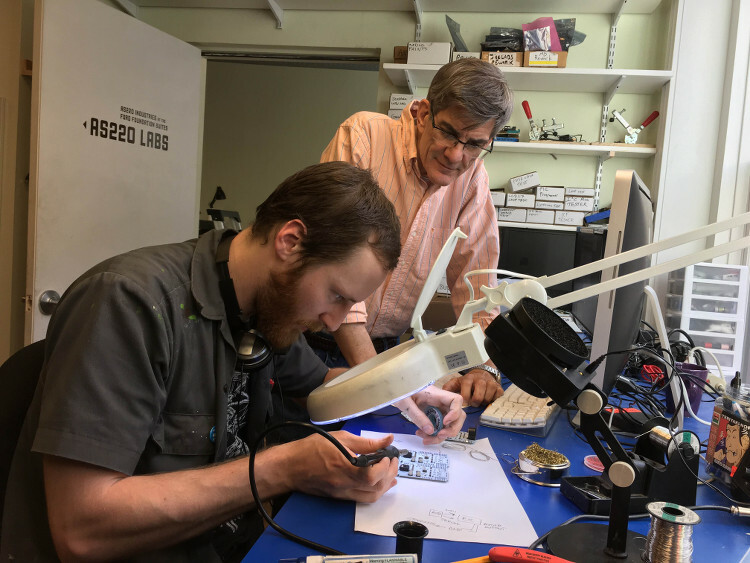 This isn’t really a merger in the traditional corporate sense; it is more like the Labs began a partnership with Modern Device owner Paul Badger and expanded the number of electronics kits in our shop 200 fold. We used to have 1 SKU, now we have 200. 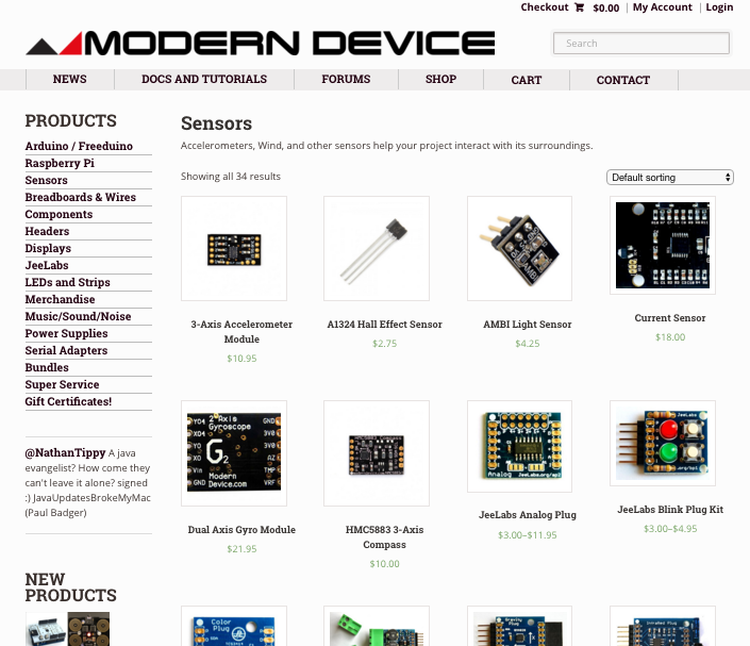 Modern Device is an innovative small business that produces open hardware electronics modules and kits. If you’ve heard anything about Arduino, that’s exactly the market it serves; artists, designers, students, and hobbyists who are doing interesting things with microcontrollers and sharing their designs. Modern Device will find an interesting sensor or microcontroller and design solutions to make it easier to use for people who are just learning electronics. Paul teaches physical computing at RISD. Modern Device came out of working with design students, looking at the problems they faced in class and building kits that made it cheaper and easier to work with electronics. He started kitting in his basement (not unlike Sparkfun Electronics) in 2007 and moved to a 500 sq ft commercial space at the Steel Yard in 2010. Modern Device grew out of that space and moved to the Hope Artiste Village in 2012. Last year we were talking to Paul about merging our operations and pooling resources at AS220 Labs. As of January 1st, Paul has gifted a large part of the Modern Device inventory to AS220 and has come on staff as Inventor-in-Residence. Britten Kroestler has also come on board as electronics technician. Modern Device is an online web shop selling electronics kits and modules. The easiest way to think of the setup is by the analogy: Nerf is to Hasbro as Modern Device is to AS220. As of January, all proceeds from the moderndevice.com web site are going to AS220 and the Industries are responsible for running the business, with Paul and Britton’s help. We’ve got a lot of new products planned and are excited to see the business grow over the coming years. I mentioned Sparkfun before, another open hardware business started in the basement. Sparkfun hasn’t reached $100M in revenue yet, but they could. We don’t see Modern Device as striving toward the same stratospheric revenue, but more as a “What If” experiment to see what happens if an innovative business in an exploding market had a community-oriented motive rather than a profit-based one. Paul’s first products came out of his class at RISD. 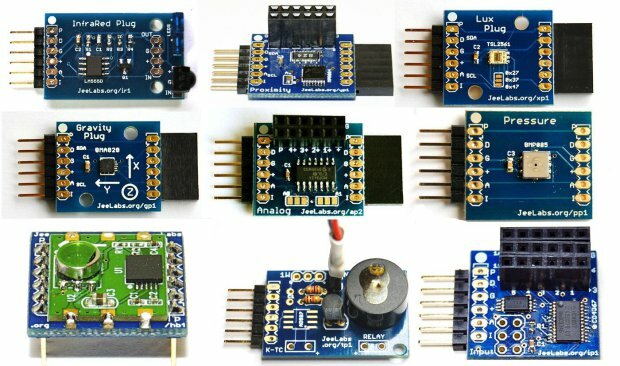 When the Arduino microcontroller development boards first came out they all had a chip on them from FTDI that allowed them to be programmed with a USB cable. 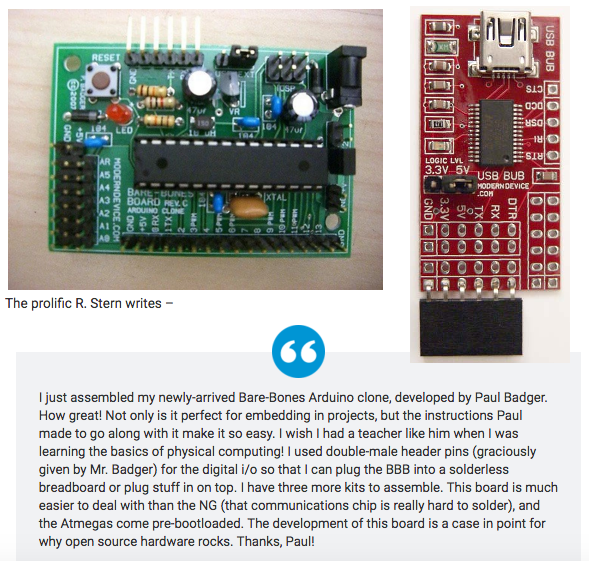 Paul’s first product, the BBB or Bare Bones Board, took the $5 chip off and moved it to a separate board called the BUB. That way you only needed to buy one BUB to program multiple BBBs, and the price to his students could come down to $20 instead of $30. An important partnership of Modern Device is with Jee Labs, an Arduino-compatible platform with a focus on low power, radio communication, and modular sensor plugs and ports. It is also a great example of what I call the Win Win True Market of open hardware. Jean Claude Whippler is an enginner in the Netherlands who corresponded with Paul about using his BBB schematics for a new Arduino-compatible board. He found an inexpensive radio from HopeRF in the ISM (unregulated Industrial, Scientific, and Medical) band. He then rearranged the pins into modular ports and wrote a lot of great code to wrap it all up in a library. The final product is called a Jee Node. Certain frequencies of radios are legal in Europe, with different bands in North America. The Win Win True Market success story here is that it made perfect sense for Paul to stock and ship the North American radios, and Jee Labs to stock and ship the European ones. Sensors in the Jee Labs ecosystem. One of Paul’s most popular libraries is the CapSense capacitive sensing library for Arduino; in 2011 some Google engineers called to see if they could use his code in a project for interfacing Android phones and Arduino over a cable. They asked Paul to design a board which became the Freeduino Host. 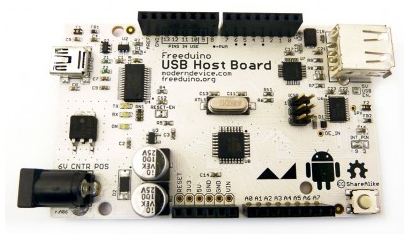 Freeduino Host could talk to an Android phone. Wind Sensor Rev. C and Rev. P.
We’re also bullish on music and noisemaking circuits. We found a great little $8 chip that is a 64 channel MIDI synthesizer, the kind of thing you’d build a karaoke machine around. We put it on a board and called it the Fluxamasynth. Fluxamasynth Shield (left). Ed Potokar makes beautiful instruments (right), some of which are powered by the Fluxamasynth. Some new products we’re working on are the One Theremin Per Child, more Raspberry Pi add ons, and more music and sound modules. We’re also hard at work on better instrumentation and datasheets for some of our unique sensors like the Wind Sensor. For more information please visit moderndevice.com.